Ulysse Nardin Conquers the World of Watchmaking with Alexander the Great Minute Repeater Westminster Carillon Tourbillon Jaquemarts. 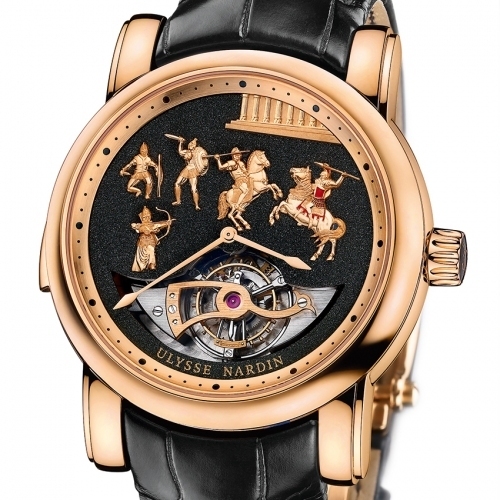 The unconquerable hero of Greek history and symbol of strength inspires Ulysse Nardin's Alexander the Great Westminster Carillon Tourbillon Jaquemarts Minute Repeater, an exceptional timepiece that showcases the mastery of Ulysse Nardin watchmakers. Technically advanced, while keeping the storied tradition of mechanical watchmaking intact, the Alexander the Great Minute Repeater is as mighty as the warrior for whom it is named. Just as there will never be another Alexander the Great, there will never be a timepiece quite like the Alexander the Great Minute Repeater. Intriguing as its inspiration, the timepiece evokes awe and admiration. Inventive and complex, its aesthetic and function are incomparable. Its mechanics are housed in a 44 mm case of 18-karat white gold or rose gold 4N, and are water-resistant to 30 meters. The visible one-minute tourbillon is integrated into the dial, its bridge created in the same shape as those used on the tourbillons James Pellaton produced for Ulysse Nardin at the beginning of the 20th century. 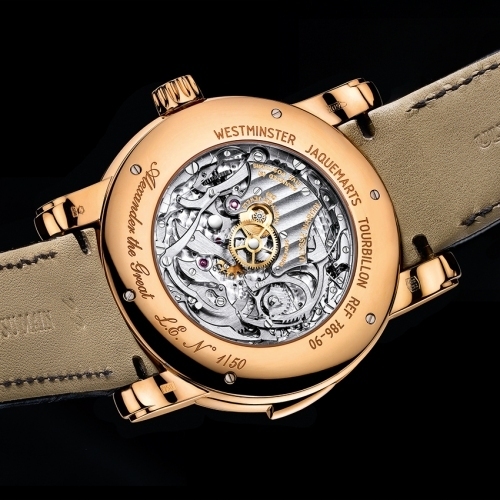 The superbly finished basic movement features 36 jewels with a diameter of 27.60 and a height of 8.50 mm. Each part of the movement is decorated, angled and hand-finished. Jaquemarts on the dial depict Alexander the Great clad in armor and engaged in battle. For instance, in one movement he is on horseback armed with a spear, and in another, the combatant stands defiant with a bow and arrow. There are five hand-crafted figures in all, prominent in appearance against the deep, charcoal-colored background of the man made diamond dial. The movements of the Jaquemarts are synchronized with the sound of gongs, moving to the minutes, quarters and hours, or to a combination of these units of time. On the far left, the warrior stands static, armed and ready for an attack. In another instance, the saber-wielding combatant makes a strike when the gongs sound on the quarters and hours; this is the only Jaquemart that moves on the hour. As a fierce, spear-thrusting horse rider and as a skilled archer, he makes his fighting move when the quarters are indicated. While shielded in red armor, he attacks on both the quarter and minute indicators. This is the only Jaquemart that moves on the minutes. Ulysse Nardin remains among the rare manufacturers in the world to use Jaquemarts on the dial of its wristwatch repeaters. Beautiful minute repeaters are a connoisseur's treasure, with the watches' ability to have time not only seen, but heard. The minute-repeating mechanism was patented by English clockmaker Daniel Quare in the late 17th century before the invention of electricity. With his minute repeater, Quare discovered a way that his clock could tell the time even after sunset. The first minute-repeating wristwatch was produced in the late 19th century. Ulysse Nardin was one of the earliest manufacturers to fuel the rebirth of the minute repeater, making its creations finite and superb, its sound quality sublime. The formation of the perfect sound is an arduous process, with each minute repeater having to be individually tuned by a master watchmaker. Tone is often adjusted by removing a small amount of metal from the gongs, but each time this is done the movement must be re-cased since the sound can only be properly tested when the watch is complete. There simply is no way around this. Each completed and flawlessly tuned minute repeater that leaves Ulysse Nardin is reflective of a truly massive investment in human endeavor – and one that is assumed with vigor. The Westminster has four gongs, each with a different tone (Mi-Do-Re-Sol). When the repeater is activated, the hour sound is Sol and the minute sound is Mi. All movement parts are decorated, angled and finished by hand. Diamond. Its name is derived from the Greek adamas, meaning unconquerable – quite fitting for a timepiece such as Alexander the Great, which features a dial exquisitely crafted with diamond. The development and use of man made diamond signifies years of research, investments and revolutions in watchmaking by Ulysse Nardin. This decorative diamond is the culmination of millions of small, faceted diamond crystals engineered to grow together to form a continuous diamond layer. The result: an authentic, highly resilient, two-dimensional diamond surface that sparkles with intensity, exhibiting various colors depending on its purity. 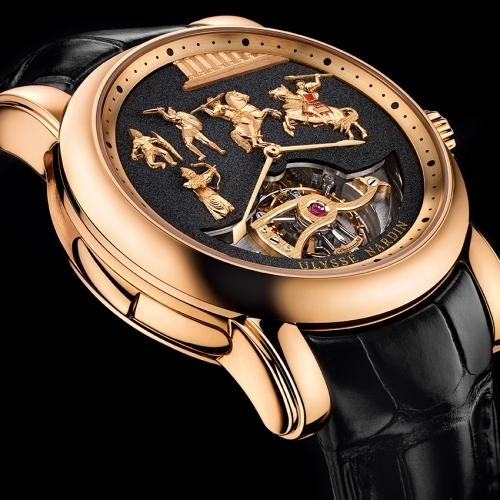 Alexander the Great Westminster Carillon Tourbillon Jaquemarts Minute Repeater by Ulysse Nardin is a timepiece that tells many stories; one about a historical legend and an explorer whose bravery was fearless, and another about an uncompromising watch brand whose constant quest for inventiveness and beauty continually leads to revolutionary innovations. As Alexander the Great made history, Ulysse Nardin’s Alexander the Great Westminster Carillon Tourbillon Jaquemarts Minute Repeater is history in the making. One hundred of these very special, limited-edition timepieces are available worldwide.